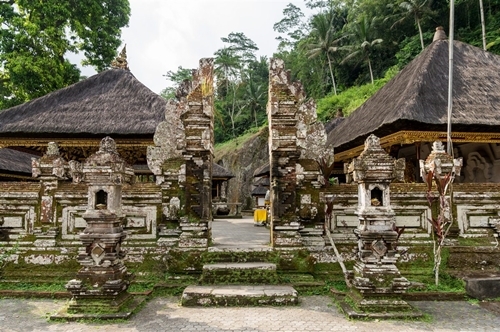 Our Indonesia tour package is perfect for those who are curious about the regions culture and in search of an experience that goes beyond the traditional sightseeing tour. The tour continues with a scenic train ride to Kertosono, on which you will have the opportunity to meet the friendly locals and admire Indonesia’s superb volcanic terrain. Ascend the magnificent Mt.Kelud, by car, walking the last stretch to the top before continuing on to the grand colonial-era buildings, historic sites and local markets of Malang. 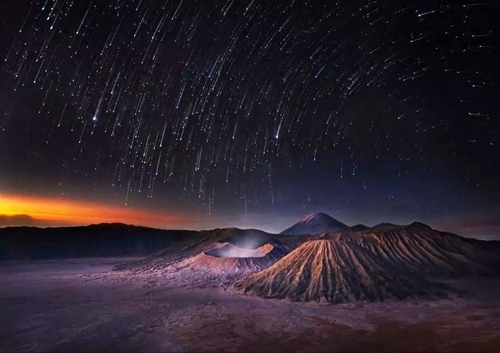 Your second volcano encounter of this Indonesia tour, involves rising early to catch the sunrise up behind the epic Mt Bromo revealing stunning views, before descending upon volcano caldera where a short horse ride will take you to a set of stairs which lead to the rim of the still-active Bromo crater. 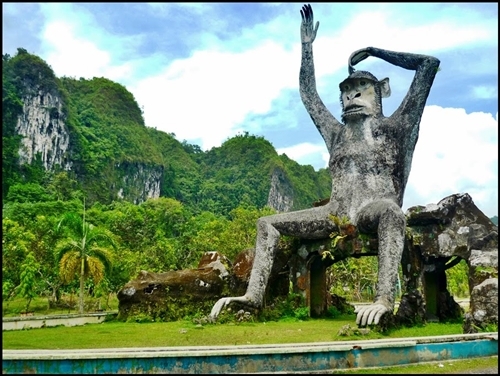 The second part of this Indonesia package tour takes an intrepid turn as you fly to Sulawesi where you will meet the enigmatic Bugis people. Immerse yourself in the age-old traditions of the Toraja tribes, famed for their elaborate funeral rites. Going off-the-beaten-track in Indonesia we unveil the incredible tribal activity of Sulawesi where the tribal groups stand oblivious to the hand of time. Arrive at Adi Sumarmo International Airport in Solo, formerly known as Surakarta, or Adi Sucipto International Airport in Jogjakarta. Your guide and private car will meet you and transfer you to your hotel in Jogjakarta for check-in. Despite the official spelling of ‘Yogyakarta’ this town is usually pronounced and often written Jogjakarta or simply Jogja. 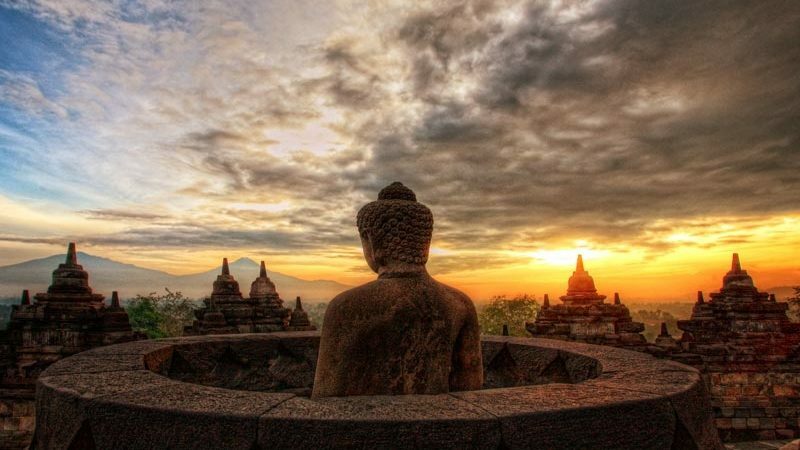 It is the most popular tourist destination on Java, largely thanks to its proximity to the temples of Borobudur and Prambanan. 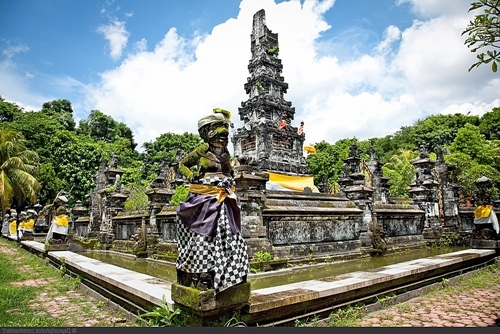 Jogja is a center of art and education and the cradle of traditional Javanese culture. After freshening up, enjoy lunch at local restaurant before setting off on an afternoon excursion. You’ll be introduced to one of Indonesia’s most famous crafts with a visit to a traditional batik factory. 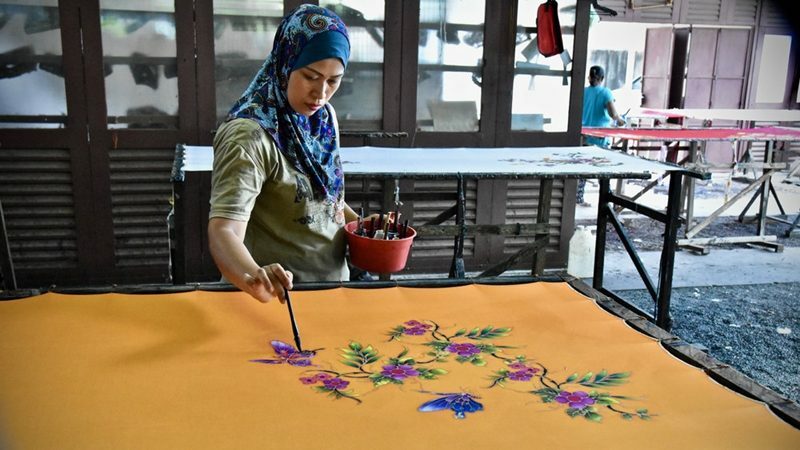 Not only will you learn about the ancient techniques and observe skilled craftsmen, but you will also have the chance to create your own batik. Start from scratch, making a design, applying wax and mixing your own dye. Your creation will be delivered to your hotel after drying. You will have the chance to learn more about Jogjakarta’s historic and cultural traditions with a city tour. Start with a visit to the Sultan’s Palace, also known as Kraton. 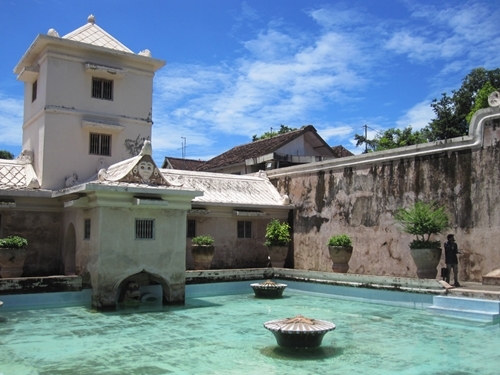 Built between 1756 –1790, is a fine example of traditional Javanese sultanate architecture. As you walk through the various rooms and chambers, you will learn more about this aspect of Javanese heritage and culture. You’ll also visit the adjacent Taman Sari, water palace and garden. This addition to the royal complex was built over 200 years ago by the first Sultan with bathing pools for his harem. 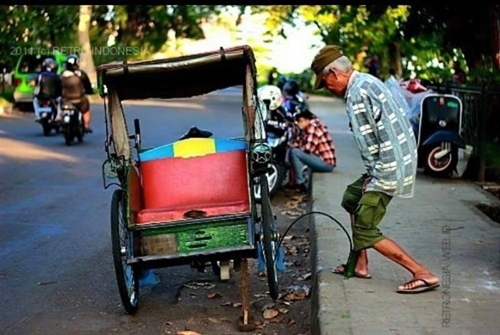 A local cyclo, becak, will then transfer you through the streets of Jogjakarta for a view of the local life of this vibrant but yet laidback city. Lunch in a local restaurant in Jogjakarta. This afternoon will be spent exploring the ancient Hindu temples at Prambanan, located 17 kilometres from Jogjakarta. Built in the 9th century, this collection of sharp, jagged temples features three main inner shrines dedicated to the Hindu trinity: Brahma, Vishnu and Shiva. UNESCO named Prambanan a Heritage Site in 1991. Following your visit to Prambanan, continue to the twin temple of Plaosan. 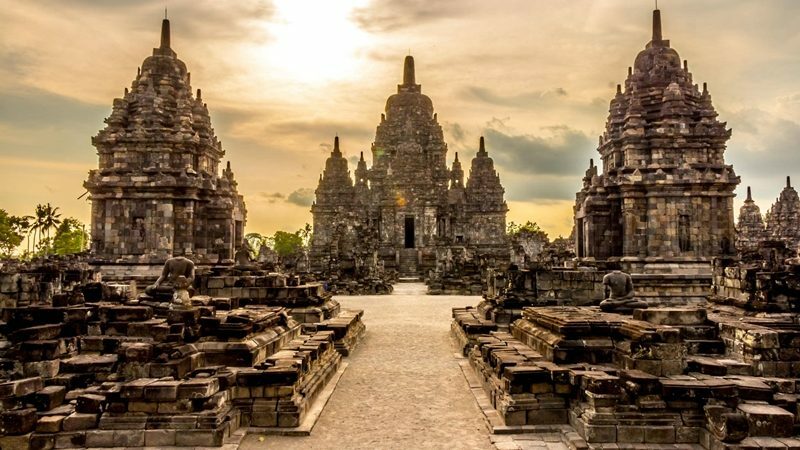 Located just 1 kilometer from Prambanan, this temple combines Buddhist and Hindu elements and has over 100 domes and dozens of intricate carvings. 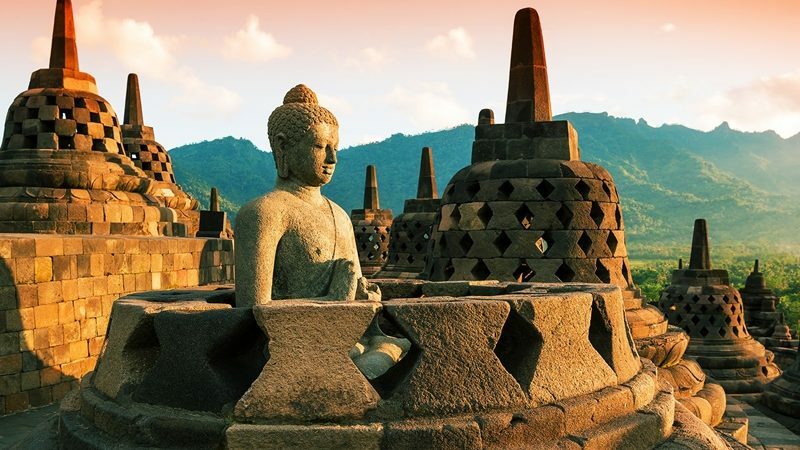 You’ll then proceed to Sewu, a Buddhist temple located 800 metersfrom Prambanan. Here, you will explore the 257 buildings that fill the grassy, rectangular complex. Return to Jogjakarta later this afternoon. After freshening up at your hotel, you’ll be treated to a performance of traditional Ramayana Dances while dining at a local restaurant. This morning drive to Borobudur, 42 kilometers west of Jogjakarta. With your guide, explore this massive Buddhist Temple– the largest in the world- and discover the incredible history behind its construction. Comprised of thousands of volcanic and river stone blocks, the temple was assembled entirely by human labor and took more than 75 years to complete. These days, the UNESCO Heritage site is still visible in its full glory- with magnificent carvings and an unusual, yet surprisingly beautiful bulk structure. Continue with a visit to nearby Mendut temple. Older than Borobudur, this pyramid-shaped temple houses three impressively carved stone statues; You’ll also visit Pawon temple, a simple yet beautiful monument known for its precise symmetry. Following the temple touring, stop for lunch at a restaurant set amid the rice fields. Dinner is at leisure this evening in Jogjakarta. After breakfast, you will transfer to Jogjakarta Railway station to board the train to Jombang. Your guide will accompany on the journey. Travelling by train in Java is a wonderful opportunity to meet local people and is also the best way to enjoy the volcanic landscapes of central and East Java. Upon arrival in Jombang, drive with your local driver and guide and stop for lunch in a local restaurant. The final leg of today’s journey is a 4 hour drive to the village of Ngadisari on the edge of Tengger Caldera. This spectacular village is one of the gateways to Mt Bromo. Check-in to your hotel and freshen up before dinner at the lodge. Awake early this morning for a sunrise tour of Mt Bromo. 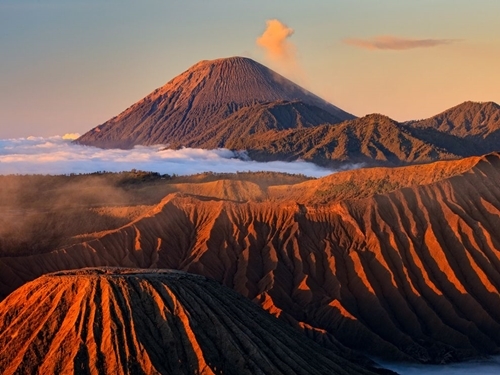 You’ll travel by 4WD jeep to a viewing spot with stunning views of the Bromo volcano and surroundings. Watch the sun rise up from behind the volcano in Penanjakan. Continue by jeep down to the volcano caldera, often still covered by mist in the early morning. The mist, combined with the grey ashen-covered ground form to create an unusual atmosphere, often compared to the surface of the moon. 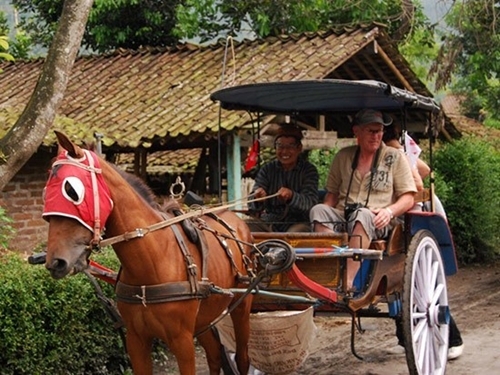 A 20-minute ride on horseback will take you to a set of stairs which lead to the rim of the still-active Bromo crater. Return by horse and jeep to Bromo Cottage Tosari for breakfast with spectacular views over Bromo and its caldera. Around 0900 you’ll switch vehicles in the town of Tosari for a four hour drive to Surabaya, Indonesia’s second largest city. 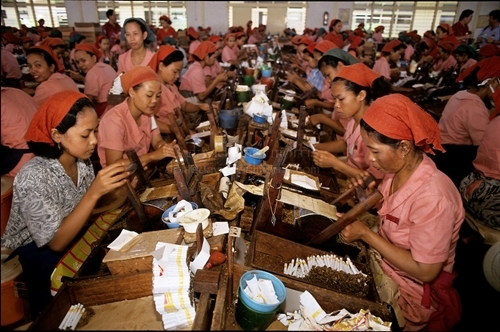 Almost in Surabaya we will stop by for a visit at the Sampoerna factory where the famous Indonesian kretek cigarettes are produced after which we will have lunch. After lunch, drive the final one hour to Surabaya arriving mid-afternoon. Check in to your hotel in Surabaya for the remainder of the day at leisure. Spend the morning at leisure then you will be brought to the airport for your ongoing flight to Makassar. Check in to your hotel in Makassar and the remainder of the day at leisure. After breakfast, spend a half day tour of the city. Start with a visit to the bustling fish market where locals come to buy their fish for the day – straight from the boat to the market. Talk a walk through local streets to arrive at Paotere harbor to learn about the famed Bugis Phinisi Schooner shipbuilders of the region. 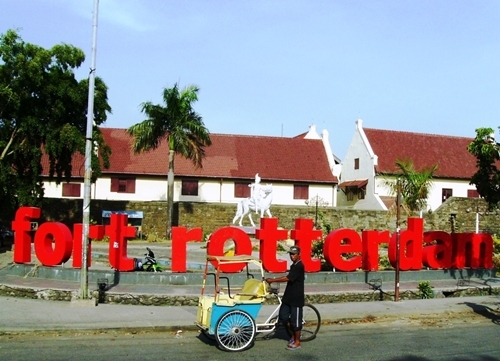 Return to the vehicle for a short drive to the city’s most iconic landmark, Fort Rotterdam. Recently refurbished it is perhaps one of the best preserved Dutch forts in all of Indonesia; learn more about the diversity of Sulawesi at the La Galigo Museum. Stroll along the Somba Opu street lined with the craft shops. An early lunch is served at Surya Restaurant – enjoy the freshest of seafood, Sulawesi style in this popular local dining restaurant. After lunch we depart to the village of Sengkang a former capital of the Bugis kingdom which overlooks Lake Tempe, the largest in Sulawesi. Late in the afternoon arrive at Sengkang. Dinner served at the Hotel. Overnight at Hotel BBC Sengkang. Rise early this morning at 05:15 to take advantage of the picturesque scene across the Lake Tempe. The Bugis people have a unique housing style where their traditional houses float on the lake. Take this opportunity to travel on a local longboat to enjoy the Bugis hospitality with a cup of tea or coffee, and maybe some fried banana (a favourite snack in Indonesia). There are about 30 houses that remain on the lake and participate in the old traditions of fishing and fish drying. Return to the hotel for breakfast. Free at leisure then check out hotel. 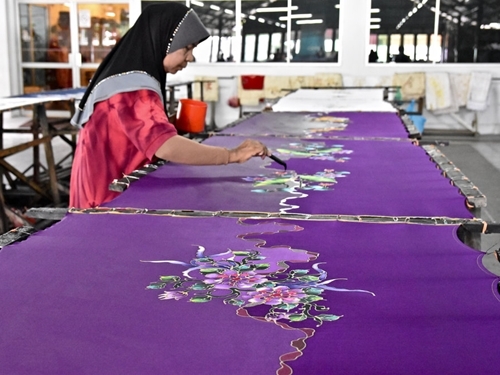 you will visit a family silk workshop in Sengkang before return to Makassar. Lunch is served in a local restaurant in Sengkang. Stop enroute at Bantimurung waterfall, famous as the Kingdom of Butterflies. Back to Makassar via Camba. Dinner will be served in a local Seafood restaurant in Makassar. After breakfast, you will stop at Taman Safari, the largest safari park in Asia. Most of the 2,500 animals here are from Asia and Africa, including Bengal tigers, giraffes, cheetahs, and komodo dragons. 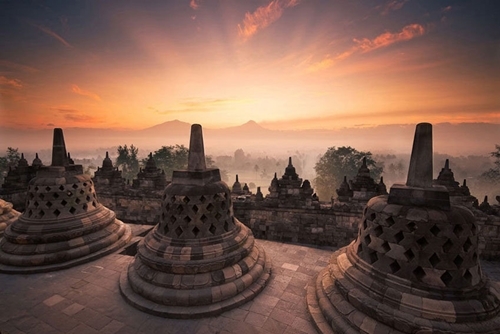 After lunch, you fly to Denpasar, the capital of the island-province of Bali, world-renowned for its soothing beaches, deep spirituality, and long tradition of arts. Our base is Ubud, the cultural center of it all, nestled amidst terraced rice paddies, Hindu temples swathed in jungle, and burbling rivers. This morning after breakfast your guide and driver will be waiting for you to start your first day with visits on the Hindu Island of Bali. We start with some culture at the ARMA museum. 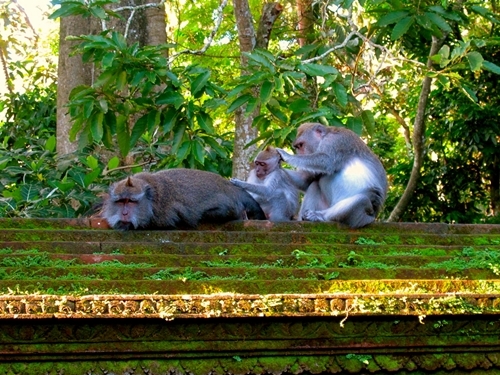 This visit is followed by a trip to Ubud Monkey Forest where you can admire the cheeky inhabitants. After this we continue in Ubud centre with a visit to the royal palace (where the royal family lives still lives today) and then we cross the street to the market where you can watch the locals buying and selling their produce from food to souvenirs to clothing. Stop for lunch at a local restaurant with stunning views over the rice terraces in the village of Pakudui. We continue today’s visits with a stop at the water temple of Tirta Empul and also Gunung Kawi near Tampaksiring. One more stop at plantation and we drive back to Ubud. No visit to Bali would be complete without witnessing traditional dance and this evening you will be treated to a performance in a nearby village. Return to Ubud for dinner at leisure. After breakfast and check out from your hotel you will be picked up by your driver and tour guide for today’s visits and activities. You will be transferred to the centre of the island for an amazing sustainable tourism excursion at Taman Sari Buwana farm. During this excursion you will experience local Balinese life while supporting a community-based tourism project in the village of Tunjuk. Upon reaching Tunjuk village, you will have the opportunity to learn how to make a variety of traditional Balinese temple offerings, continue through the rest of the compound and learn the animal and vegetable components that are the basics of any Balinese home. Next meet the older generation of the village as they show you how to weave pandanus leaf and make floral temple offerings. 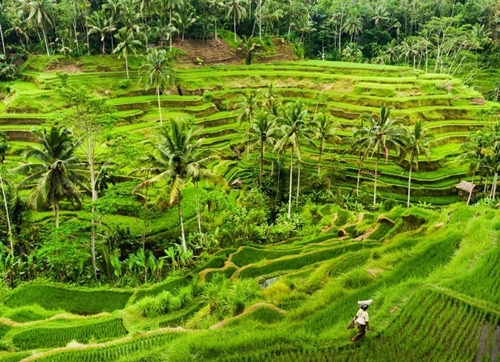 You’ll then walk with the local farmers to their rice fields, locally referred to as sawah. Alongside the farmers, you will learn how to plant, transplant or harvest rice (depending on the season). Prepare for farming activities by donning a farmer’s hat, covering up with mosquito repellent and picking up a local mattock (small farm tool) all provided by the farm. We recommend wearing flip-flops or similar as well as bringing sunscreen. After farming, you’ll visit seasonal vegetable and flower plantations including coconuts where locals will demonstrate their ability to climb up the trees and gather young coconuts for some refreshment for you to enjoy. 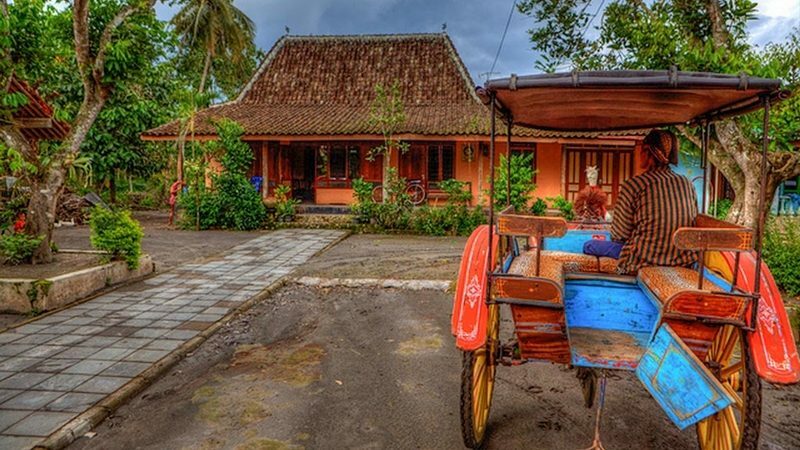 Next, return to the home base where you take a snack of boiled cassava with freshly grated coconut in the traditional kitchen before enjoying a delicious lunch at the farm. Following a late lunch, set off by road to begin the drive towards your hotel. Dinner at local restaurant. After breakfast, we visit the artisan village of Mas, known for its intricate wood carvings. Much of the work done here is praised for its artful blend of man and nature. Later, we browse the colorful local market, whose stalls brim with fabric, wooden idols, paintings, batik, sarongs, and all manner of Bali’s delights. We’ll end our morning with a cooking class, learning to make a local dish and, of course, enjoying it for lunch! After lunch, continue your tour to West of Bali. Along the way you will stop at the serene Taman Ayun temple near Mengwi. This temple features wide tropical gardens and a large courtyard as well as traditional multi-story roofs. 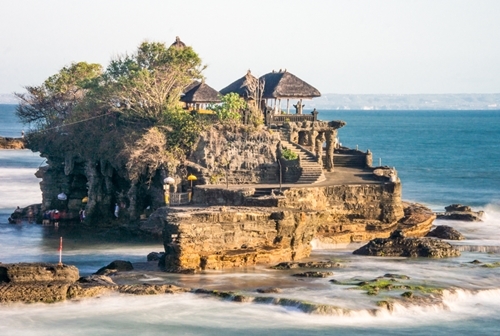 After this visit we go for an incredible sunset at the famous (and most photographed temple in Bali) Tanah lot Temple. Overnight in Tanjung Benoa, Nusa Dua. Today is free for you to explore on your own, or simply relax by the pool or with a spa treatment at the hotel. Spend the day relaxing on the beaches or indulge in a bit of shopping in the local area. 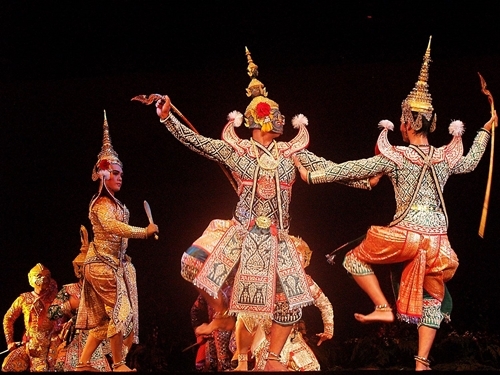 This evening experience the trance like Kecak dance in a superb location overlooking Uluwatu temple. 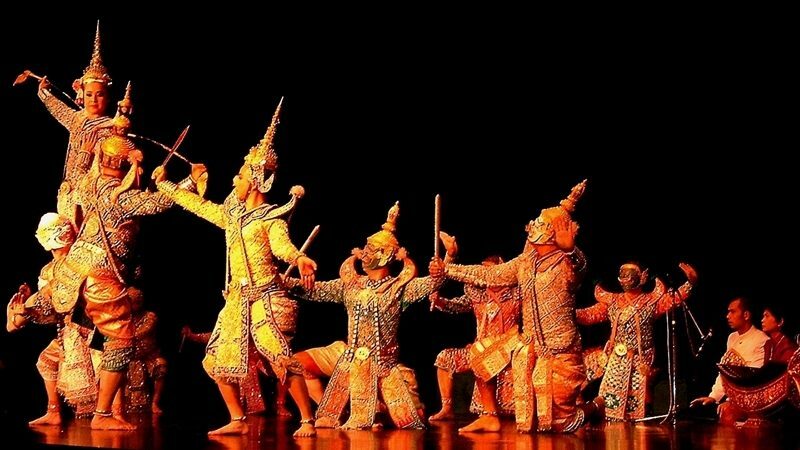 Originating in the 1930’s this dance is performed only by men and occurs without musical accompaniment as an ode to the Monkey of the Ramayana Ballet. The location for this dance is set on a cliff top, overlooking an Indian Ocean sunset with Pura Uluwatu in the background. Following this performance, dine under the stars on the freshest of seafood on one of Bali’s more expansive beaches – Jimbaran. Your morning is free until your private transfer picks you up from your hotel for your onward flight from Denpasar airport. Entrance fee, donation fee and luggage handling. Accommodation: as per mentioned in the itinerary (or similar).